“Be home and dry” is a popular expression denoting success; yet a lot of UK houses do not succeed in keeping dry and being good, healthy homes. 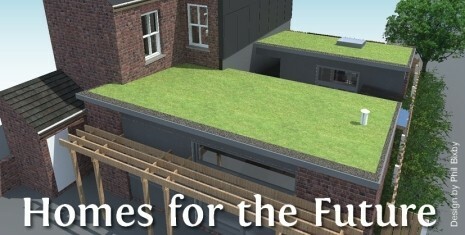 This event gives you an opportunity to see examples of what homes of the future could look like, featuring 3 Passivhauses and one of the largest straw bale buildings in Europe, and how old houses can be brought up to date - an eco-retrofitted Victorian house. Full details and home descriptions can be found on St Nicks website. Three Passivhauses (designed to use very little energy, each with its own unique features) and/or an eco-retrofitted Victorian house of local architect Phil Bixby who designed the Passivhauses. See St Nicks website for more details and BOOK via Eventbrite – essential so that you receive addresses and more visiting details. York Eco Depot: one of the largest straw bale buildings in Europe, with other sustainable features. No need to book ahead. Please note this is a unique opportunity as the Depot is not normally open to casual visitors. See them all in the company of St Nicks Outreach Officer to guide you along, and share One Planet Living tips with others - come on our cycle ride! Starting promptly at 2pm from St Nicks Environment Centre – after the Low Carbon Lunch – we’ll cycle around 5 miles in between destinations on quiet roads or cycle paths where possible. Please BOOK ahead via Eventbrite. Would you like to start the day with a delicious Low Carbon Lunch at St Nicks Environment Centre? Find out about energy saving techniques for your home, or share your own tips, over delicious vegan lunch made in haybox cookers by Jane and Seggy Segaran, authors of Haybox Cooking – Save Energy with Fireless Cookers. BOOK and find more details at this page. Free entry to visit homes, donations to St Nicks welcome.